The International Lightning Class is a 19’ V-bottom centerboard sloop designed in ‘38 by Olin Stephens of Sparkman & Stephens fame. 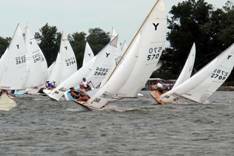 These boats first raced on the eastern seaboard & are still raced aggressively all over the world. 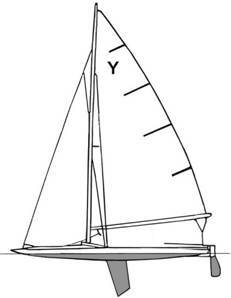 The steel centerboard & hull shape give the boat the combined characteristics of both a planning hull & a keel boat. Lightnings are stiff enough to carry a proportionately large sail area & to fly a spinnaker (with a couple of crew aboard). 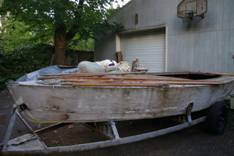 This boat was discovered in Portland, Oregon & was originally considered to be unsalvageable, but when it was dusted off & inspected, turned out to be in amazingly good condition. All the bits & pieces were still with the boat, including a beautiful collection of bronze fittings specific to the boat. The mast was unusable, so a new spruce mast will be fitted. This project is in its infancy, so when I have some real work accomplished I’ll begin posting photos & text. The bottom picture is of a nicely done example, certainly inspiring. Very nice sailing characteristics. She’ll be a treat. The Y-Flyer sailboat is an 18’ shallow V-bottom centerboard sloop also designed in ‘38 by Alvin Youngquist as a training platform for the larger A-Scow racing boats in the Midwest. The Y-Flyer uses a two-person crew & can fly a spinnaker, although US class racing rules don't allow it. These boats are typical of extremely fast planing hulls & are raced throughout the US & Canada. They use a heavy swing centerboard keel & are noted for their blunt squared off bow & use an unusually long whisker pole for downwind runs. This boat was discovered in Oregon City, Oregon & was raced by the commodore of the Portland fleet who also wrote a rather nice treatise on construction of the Y-Flyer. 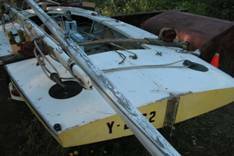 The boat when found, was in reasonably good condition, having been stored under cover for a number of years. All the original hardware, rigging, sails & miscellaneous stuff came with the boat, making this a very nice restore project. The boat has been disassembled & the parts labeled & inventoried, in preparation for reinstallation. When boatshow season is over I’ll get back to this one & will post the first batch of photos & text. The top picture is of the boat when it was brought back to the shop for disassembly. These are just good clean fun. 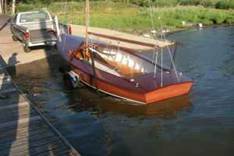 Sandy River Boatworks has been involved in a number of boat renovation & restoration projects. A few of our current projects are described below. Sandy River Boatworks is ready & willing to take on the design of new boats & can supply working drawings & offsets for boats up to one ton. Our preference is to design for the wooden boat market & can offer up detailing for boats built carvel, lapstrake, plywood, & of course strip plank. We use modern software to calculate hydrodynamics & CAD to render our designs into drawing format. Our listed boats are designed using these software tools as well. Call our shop for pricing & delivery information. 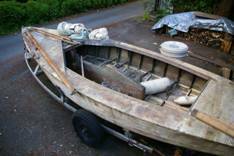 Sandy River Boatworks will take any of our boat designs & construct a finished boat for a customer.